Easy on! Easy Off! NO tools are required! The new Pole Spear Resting Hook can now be installed and removed in less than one second… WITHOUT TOOLS and WITHOUT REMOVING YOUR BAND. And I am sure, it is MORE COMFORTABLE THAN ANY OTHER RESTING HOOK ON THE MARKET! Why use a MAKO Pole Spear Resting Hook? No pain: Holds you band for as long as you want. No discomfort: The most comfortable resting hook on the market! No Spooked Fish: Eliminates jerky loading movements that scare fish. Ready to shoot: less than a second to release. No Tools required: Easy on / Easy off! This simple to use “MAKO Pole Spear Resting Hook” will put more fish in your cooler and eliminate all pain and discomfort associated with trying to hold your pole spear band for a long period of time. Made from 304 stainless steel, this little hook is formed for maximum ergonomic comfort and performance. “NO MORE SPOOKED FISH”: In addition to eliminating the pain associated with long periods of band holding, the MAKO Spearguns “Pole Spear Resting Hook” will make you more STEALTH LIKE by eliminating unnatural movements associated with loading your pole spear bands. Never spook another fish again! "Ready to shoot in one second or less!" When you are ready to shoot, simply pull the hook free from the dyneema loop. In less than one second, the hook is released and you can take your shot. This is by far the best pole spear resting hook on the market. More comfortable on your hand than any other resting hook. 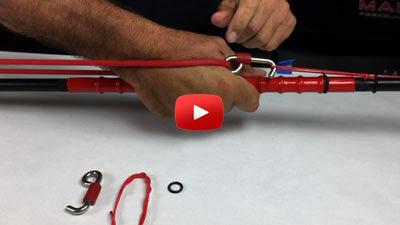 Attaches to any pole spear band. And, because I sell direct to you, instead of through dive shops, my products are much lower. 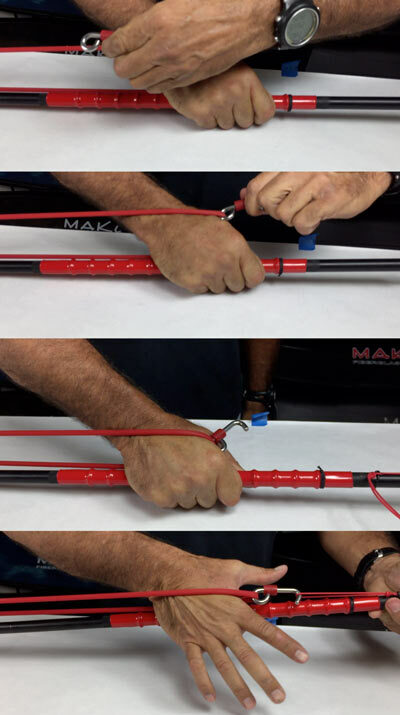 Installing the MAKO Spearguns Pole Spear Resting Hook is simple & quick. highly elongates your time of grip on the polespear without cramping your hands and wrists. no spooky movements to scare the fish away, makes easy the switching polespear between of hands for better a better angle to shoot. Recommended 100%. awesome customer service! Brad was able to ship the resting hook for cheaper than stated upon purchase. He then contacted me and credited me back the difference! I found this completely refreshing and will definitely use mako again!